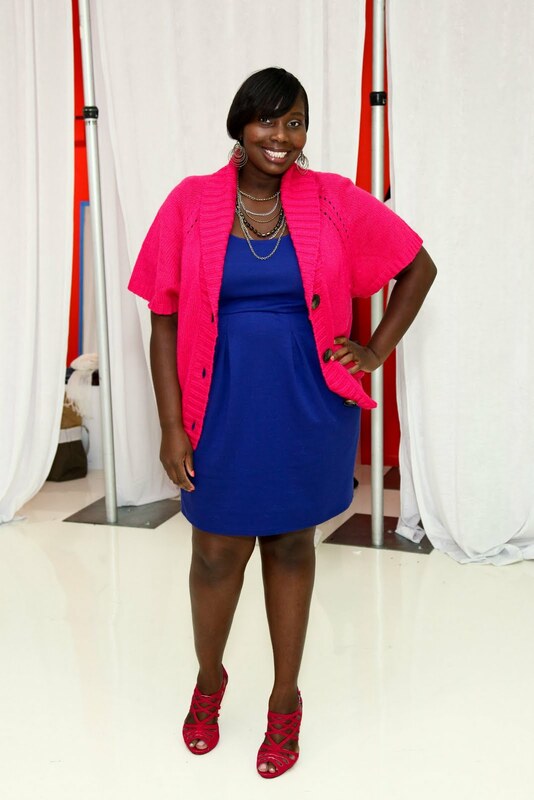 Last month I was invited to Old Navy’s Fall Essential event at one of their showrooms in NYC. The event was spotlighting their new collection of sweaters and jeans. When I got to the showroom there were very few sizes left in the jeans and unfortunately I could not try on anything from their new Fall denim collection. Needless to say, I was a little disappointed because I had my eyes on those motocross jeans and their new jeggings. Nevertheless, I believe in making things work, so I cruised the showroom and spotted this bright pink sweater cape. Pink is my favorite color (I do like purple too) so, I scooped up the sweater immediately. Luckily I was wearing my cobalt blue dress from Faith 21 and thought the pink would pay a nice compliment to the dress. As I continued looking around. I found some really cool jewelry that they had and picked up this multi-layered chain necklace and earrings. I thought it was kind of odd that I had on my pink shoes that day and realized I matched head to toe. I’m not really a matchy matchy kind of girl, but, I thought the blue and pink worked out well. The sweater was super soft and it draped nicely over my body. I liked the shawl necked collar and large buttons because it gave the cape an updated look. Surprisingly the jewelry was very cute and I wear the multi-layered necklace over my high neck dresses and tops to spice op some of my simple looks. The sweater cape will definitely be a go to piece in my wardrobe because of it’s versatility. It looks good buttoned up, with a tee and jeans, as well as thrown over a dress. Please checkout the little video Old Navy made featuring me. I know I blinked 500 times. Still working on that. :). Please note: For attending this event. I received a coupon for a free pair of jeans. I also received two sweaters, a necklace, and earrings. However, my review of this item is was not based on the items I received free, but, on my honest thoughts and feelings.